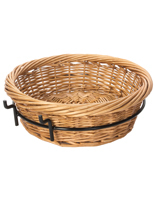 More Number of Basket Options Available! There's nothing more enticing than a set of produce display baskets to present mouthwatering fruit and vegetables to shoppers. Whether you're a farmer at a weekend market, a storeowner, or simply a person who always has a lot of healthy food on hand, vegetable baskets present your food in a natural, classic way. 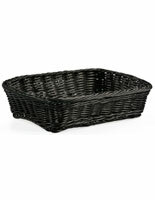 These wicker baskets come in a variety of shapes and sizes, and can be placed on a tabletop, countertop, shelf or rack in a storefront or home. 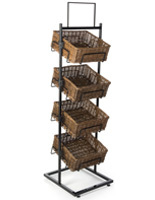 Many produce stores use multi-tier produce basket racks to display vegetables at an angle towards the customer for easy viewing and sifting. 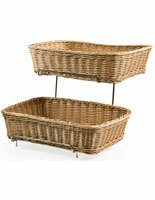 For large amounts of produce, try a couple of 3 tier basket stands. 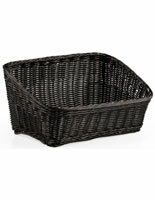 They include price clips for the baskets, and each wicker bin can hold 25lbs, which equals a lot of produce. The racks are lightweight, save space and can effortlessly be brought to farmers markets, county fairs or to the farm's storefront. 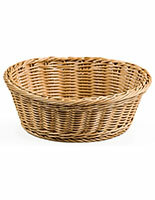 Bed & breakfasts and hotels often use single baskets as an attractive way to hold apples, peaches or plums on the table or in the buffet room to provide nourishment for the guests. 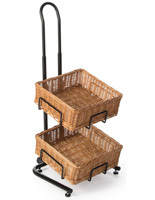 A square wicker vegetable basket with a wheeled rack is perfect to hold large quantities of corn, and wheel around the storefront or farmer's market. 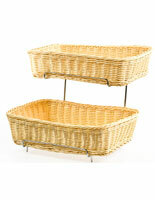 Your guests will appreciate the compartmentalized baskets as they choose the perfect corn, eggplant or cucumbers. 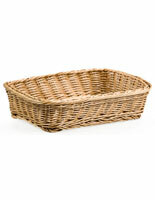 Pick out your favorite baskets, and remember to shop Displays2go for all of your storefront display needs!